May 28 is coming fast and you know what that means: National Hamburger Day. Not that anyone in this community needs inducement to put America’s favorite ground meat to the fire. The stats are in and not steak, not bratwurst, not ribs, but burgers top the list of our favorite foods on the grill for Memorial Day. So here’s the question: What constitutes the perfect burger? Grind it fresh: Start with freshly-ground beef, preferably from a grass-fed steer. Use a meat grinder or a stand mixer fitted with a grinder attachment. For the best texture, almost freeze the meat before grinding; freeze the grinder parts, too. Use the coarse blade and grind the meat twice. Or ask your butcher to do it. Blend the beef: Use chuck as your starting point, adding rich-flavored cuts like sirloin, brisket, even boneless short ribs. More outlandish additions can include beef marrow, bacon, or uncured pork belly. Experiment, and take notes so you can replicate your successes. Chew the fat: A succulent burger needs fat—at least 20 percent. Don’t worry—some of it will cook out. Handle with care: Start with thoroughly chilled ground beef. Chill your hands under cold running water. Divide the meat into equal portions of 7 to 9 ounces each, then gently form into patties about 1 inch thick and 1 inch larger than the buns. (They’ll shrink.) With your thumbs, make a shallow depression in the top of each burger. (Burgers puff more in the center.) Handle the patty as little as possible to avoid melting the fat or compressing the meat. Chill out: Chill the patties for at least an hour before grilling. Line a large plate or a rimmed baking sheet with plastic wrap. Arrange the patties in a single layer, then cover with additional plastic wrap. Refrigerate for up to 6 hours. Season like you mean it: Coarse sea salt (I like Maldon) and freshly ground or cracked black pepper. Of course, I wouldn’t say no to my Best of Barbecue Mediterranean Rub or All-Purpose Barbecue Rub. Grill it hot: Set up the grill for direct grilling and preheat to high. In the best of all worlds, you’d grill over a wood fire. At very least, toss some wood chunks on the coals or on the Flavorizer bars of your gas grill. Keep the burgers refrigerated until you’re ready to grill them. 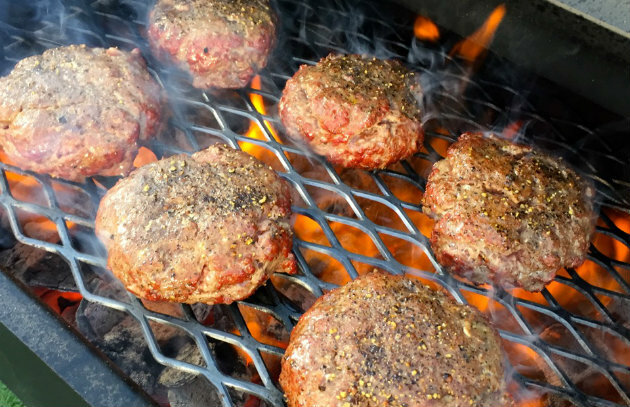 Place the burger patties on the hot grate and grill them until the bottoms are browned, 2 to 3 minutes. Using a spatula with a sharp blade, turn and continue grilling the patties until cooked to taste, 4-1/2 to 5 minutes in all for rare, 6 to 7 minutes for medium-rare, and 8 to 9 minutes for medium. (The USDA recommends ground meats be cooked to an internal temperature of 160 degrees.) For cheeseburgers, place sliced cheese (good cheese, like aged cheddar or provolone) on top the last 2 minutes of cooking. Never press: Never press your burgers with a spatula—unless you want to wring the juices out of the meat and onto the fire. Enough said. Give it a rest: Transfer the burgers to a plate or platter and let them rest while you grill lightly buttered buns, freshly baked at home or from a local bakery or farmers’ market. Watch the buns carefully as they can take less than a minute to toast. Build it right: Place a lettuce leaf on the bottom half of the bun (to keep the bread from getting soggy with the juices). Add the burger, then the tomato (at room temperature please), pickle and other condiments. We’ll leave the precise configuration to you. The following chefs and burger joints have set the bar high. We know you’ll rise to the occasion! “DB Burger” by New York mega-chef Daniel Boulud: Enhanced with foie gras, truffles, and shredded wine-braised short ribs. “Fat Doug” by Iron Chef Michael Symon: Topped with pastrami, Swiss cheese, stadium mustard, and coleslaw. “Umami Burger” by the California-based burger chain: Topped with umami-rich ingredients like a Parmesan cheese crisp, shiitake mushrooms, caramelized onions, roasted tomatoes, and house-made ketchup. Share YOUR version for the perfect burger (photos please) on the Barbecue Board. And from all of us at BarbecueBible.com, happy Memorial Day! 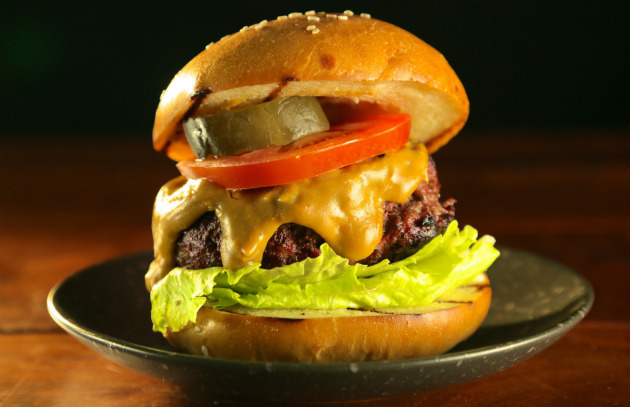 Get an essential burger recipe to start with.